A pet hamster called Fudge, which hitched a lift from Devon to Scotland hidden inside a golf bag, has been given a new home north of the Border. Fudge escaped from a box in a hire car on the last day of Kingsley Moyle's golfing holiday. 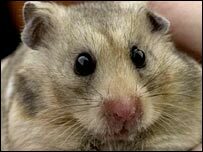 The elusive hamster was found hidden in the car by the next person who hired it - but Mr Moyle had returned to Devon. The woman who found Fudge has now given him a home - with the blessing of its previous owner. Mr Moyle, from Kingsteignton, said: "Amazingly he has been found, a lady in Scotland used the same hire car after us and suddenly he appeared. "At the end of the day he is in Scotland and by now he's probably acclimatised to life up there. "I've been told that this lady is happy to keep him and that's fine - hopefully it won't turn into a tug of love. "We are just pleased it's a happy ending that he was found alive because we thought the worst." Fudge's amazing story began at the start of September when he first went missing and after looking all over his house Mr Moyle had given up. The 42-year-old flew to Scotland from Exeter with three friends for a three-day golfing holiday and half way down the fairway on the first course Fudge suddenly appeared at the top of his golf bag. Delighted that he had found the adventurous pet, Mr Moyle kept a close eye on him. The hamster visited Edinburgh's oldest course, Auchterarder, the luxury golf resort at Gleneagles and finally the championship course at Turnberry. At the first two courses he went around the greens with the golfers, but at Turnberry Mr Moyle decided he would be safer in a cardboard box, with food and water. However, a second great escape was performed and when Mr Moyle returned to the car he had hired, he found Fudge had chewed through his box and disappeared again. Assuming he had somehow got out and with their flight leaving that day, the car was handed back and he flew home. But on Monday he found out the next person to hire the car had found Fudge and was so taken with her surprise passenger she agreed to take him in. He said: "It's amazing really, if you wrote it as a film script no-one would believe it."